FREE Dagupan Cruise ~ Philippine Freebies, Promos, Contests and MORE! 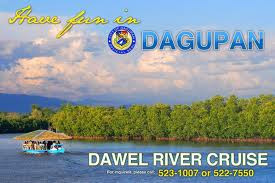 The FREE Dawel River Cruise was launched last year by the Dagupan City officials to highlight their city pride, the Dagupan "bangus". To attract more visitors and tourists this year, they included unique attractions showcasing the city's culture and history to bring the attraction's value a notch higher. For 45 minutes, get to enjoy Dagupan's serene waterways lined by mangroves and fish ponds hosting migratory and local birds, an exposure trip to the fish ponds, you can feed bangus and learn how it is raised, marketed and processed, plus a glimpse of history as you see what's left of the bridge that supported the tracks of the Philippine National Railways' northern Luzon line (Ferrocarril de Manila-Dagupan). The ecotour will pass through the Dawel and Watac-Mamalingling Rivers, tributaries of Pantal and Bayaoas Rivers. Three (3) native hut-inspired boats and two smaller boats can tour 25 people. On the other hand, the bigger boat can accommodate 40-45 passengers. The river cruise is offered to the public and visitors for FREE, however city officials may charge minimal fees in the future.